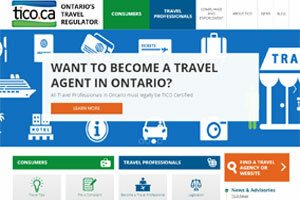 TICO’s website now has a brand new look with more user-friendly functionality. The website is now responsive to all mobile devices, and with an improved online search feature, consumers will be able to locate a TICO registered travel agency or website when they are on the go. Other new features include a Learning Centre page with informational tutorials, which will be expanded, as well as a one-stop resource for those who wish to start a new travel business, and information for those who are winding down their business. Check out the new look: here.